This morning Rahamim staff, volunteers and friends gathered together in the winter sunshine to mark Plastic Free July with a plastic-free morning tea. We are dreaming of a waste-free Christmas! Does the thought of all the waste involved in celebrating Christmas horrify you? As we think about giving Christmas gifts we are often mindful of those less fortunate than we are – but what would it look like to give a Christmas gift to planet Earth? As Pope Francis writes, “The earth itself is “among the most maltreated and abandoned of our poor” (Laudato Si’ 2). At a time of giving and feasting in our “throwaway culture”, waste can really diminish the joy of the season, so we’ve put together a few ideas that may help work towards a waste-free, joy-filled Christmas! Have a go at making a tree from branches or found objects. If you really want a live tree, consider natives such as She Oak or Wollemi Pine, which are great in pots and can be used for years to come. Decorate with homemade trinkets or recycled goods. 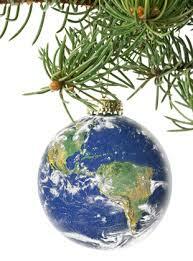 Every year we throw away enough wrapping to go around the equator nine times! And most of the wrapping paper available is non-recyclable. This year, try to find recyclable or eco-friendly wrapping paper, use up old newspapers (you could even paint onto them), or consider waste-free wrapping options, such as reusable cloths like old scarves, vintage hankies or retro tea towels and table cloths. The supermarket aisles at this time of year can be jam-packed with imported and often preservative-laden foods. In the mad rush to set a bountiful table, it can be tempting and convenient to buy whatever looks festive. Just keep in mind that most of us over-cater at Christmas and the food waste can be colossal come Boxing Day. In an effort to significantly reduce our overall food waste, we need to make sure we are extra mindful when planning our menus. Instead of chucking out your left overs freeze for later use or get creative and turn them into something else. Remember to keep fruit and vegetable choices seasonal and Australian. If you are serving meat and seafood do a little research and choose ethically and sustainably. The Sustainable Seafood Guide is a good place to start for seafood and you can look for local suppliers similar to Feather & Bone. Also try to make, instead of buy - you will never buy a fruit mince pie as delicious as the one you make! And if you start your preserving now, you can have pickled cherries, mustard fruits and relishes ready for the table. With domestic mail doubling during the month of December it is safe to assume that Christmas cards make up a very high percent of post. Why not make your own Christmas cards from old ones or send ecards instead. Food is a great gift; it is always appreciated and never gets dumped at the charity store a few months later. Make a batch of pickles, kimchi, or cordial and give them to your loved ones. They will have a lot more meaning than another scented candle! Choose pre-loved or vintage gifts from markets, op-shops, www.etsy.com/au/ or garage sales! If you're out of time for making gifts this year, then don't forget to shop small! Get out of the big department stores and head to your local shops to help the small businesses in your neighbourhood. Buy handmade and local products. When you buy items made on a small scale, chances are you are supporting fair wages and low-impact production. Instead of buying material gifts this Christmas, why not give an experience that one of your loved ones will remember such as tickets to a popular show or play, or a short holiday, or even a gift voucher which will ensure that the receiver will buy something they actually need or really want. Rahamim Ecology Centre will be closed from 23 December 2017 to 2 January 2018, inclusive. a peaceful and happy Christmas and New Year. “Let ours be a time remembered for the awakening of a new reverence for life, the firm resolve to achieve sustainability, the quickening of the struggle for justice and peace, and the joyful celebration of life”. Recycling was once seen as an inconvenient request our local council made – we had to separate the ‘waste’, that we had become accustomed to simply throwing in the rubbish bin, into a separate container. Today recycling is a part of our everyday lives and it’s expected to happen at home, in the office, shopping centres, restaurants and hotels.